Old Saybrook, on the west side of the entrance to the Connecticut River, was first settled in 1635 and incorporated as a town in 1852.
lt was a prosperous town full of sea captains' homes, and was for many years the only major stop on the railroad between New London and New Haven. The town remains a yachting capital and a quaint, exclusive community. The mighty Connecticut is New England’s largest river, flowing from the Connecticut Lakes in northern New Hampshire to its mouth between Old Saybrook and Old Lyme. The growth of commerce along the river—navigable as far north as Hartford—as well as fishing based in Old Saybrook, led to increased shipping traffic. To mark the entrance to the Connecticut River and the harbor of Old Saybrook, officials decided to erect a lighthouse in 1802. Land was purchased from William Lynde for $225, and the 35-foot wooden tower was built by New London carpenter Abisha Woodward in 1803. The first lighthouse was criticized by mariners for being too dim and too short. A group petitioned for the tower to be raised by 25 feet, but it was decided to rebuild the lighthouse instead. A new 65-foot brownstone tower was erected in 1838. The lighthouse is similar to the masonry towers built earlier at New London and Faulkner's Island, but this one is considered to represent the finest work of the three. The original wooden spiral staircase appears to have been replaced during an 1868 renovation. 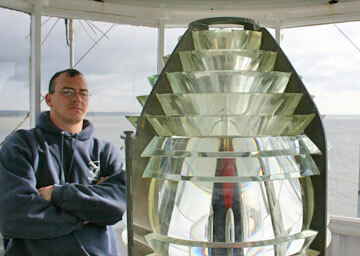 The lighthouse's system of 10 lamps and reflectors was replaced in 1852 by a fourth-order Fresnel lens. A fifth-order lens was installed in 1890. A fog bell was added in 1854. Light-house is a good building and in good order. Dwelling is a frame building; the sills and lower part of the house are decayed in consequence of the land being raised about two feet above the sills; this house ought to have been raised when the house was raised. There have been some conveniences added to the house since I supplied it— – such as blinds to the windows. Lighting apparatus is good and in first-rate clean order, and so is everything in and about the premises. An 1833 keeper's house remained in use until it was demolished in 1858 and replaced by a new Gothic Revival gambrel-roofed wood-frame house. This house was regrettably destroyed by the Coast Guard in 1966 and replaced by a modern duplex house, against the wishes of the Old Saybrook Historical Society. With the addition of the Saybrook Breakwater Light in 1886, Lynde Point became commonly known as the "Inner Light," while the Breakwater Light became known as the "Outer Light." One of the most interesting personalities in the history of this light station was John Ninde Buckridge. John Ninde Buckridge. Courtesy of Margaret Bock. Born in New York City in 1833, Buckridge left the navy in 1859 but enlisted in the New York Heavy Artillery in 1862. While on a woodcutting detail at Brandy Station near Rappahannock, Virginia, his right leg was injured and later amputated. After running a store for a few years, he joined the Lighthouse Service in 1877. Following six years as an assistant at Stepping Stones, Stratford Shoal, and Eaton’s Neck lighthouses, he was assigned as principal keeper at Lynde Point on June 26, 1883. The grounds about the light he has arranged in a strikingly beautiful manner, and in summer they blossom as a rose, and are a favorite resort. He and his wife, Margaret (Abel), had six children. The first and last were both named Elizabeth, and both died young. Their son Thomas went on to become a lighthouse keeper at Saybrook Breakwater Light, among other locations. The Buckridges’ daughter Minnie married Ezra Kelsey of Westbrook, Connecticut, at the lighthouse on March 22, 1890. Although the day was described as bleak and blustery, nearly 100 people attended. The happy couple left “amid the hoarse screech of congratulatory steamer whistles on the river and the customary shower of rice and old slippers.” Ezra Kelsey later became a lighthouse keeper at Rockland Lake Light on the Hudson River and Crown Point Light on Lake Champlain. Margaret Buckridge narrowly escaped death or serious injury one day in April 1901 when a sudden gust of wind knocked her off the seawall near the lighthouse. She fell about ten feet to the rocks, fracturing several ribs and getting knocked unconscious in the process. When she came to, she realized that the tide was coming in and that nobody could hear her cries for help. She managed to drag herself to safety and eventually recovered from the ordeal. Elmer Gildersleeve, a native of Port Jefferson, New York, succeeded Buckridge and remained keeper until 1925. His son Lawrence, who was born at the lighthouse in 1906, was interviewed in 1978 for an article in the New Haven Register. Lawrence, was one of eight children born to Keeper Gildersleeve and his wife during the 34 years they spent at lighthouses. Sometimes young Lawrence was sent out the front door to fish for the family’s supper, and usually within about 20 minutes he’d catch some eels or flounder. When he was 14 he dug for clams and oysters, selling the steamer clams for 25 cents a bushel and the oysters for 45 cents a bushel. To get to school in those days, Gildersleeve Lawrence had to walk across an old wooden plank bridge at South Cove to a building four and a half miles away. He also remembered helping railroaders turn their engines around on a turntable near Saybrook Point. For his trouble he’d get a free ride in the engine. The light was electrified in 1955 and automated in 1978, but the 1890 Fresnel lens remains in place and Lynde Point Light continues to exhibit a fixed white light as an active aid to navigation. The 1966 duplex house serves as Coast Guard housing. Actress Katharine Hepburn lived for many years in a house close to Lynde Point Light and Saybrook Breakwater. The road to the lighthouse is closed to the public. The lighthouse can be seen from several places along the shore, but is probably best viewed from the water. Michael Allen, chief engineer for Coast Guard Aids to Navigation Team Long Island Sound, was living at the light station in 2005. Allen said sunsets seen from the top of the lighthouse were "amazing."